As a little girl, year after year I watched my father get ready for deer season. Scouting the woods for deer, hanging the bright orange suit outside to “air it out,” the early mornings, packing his lunch with Mom and the long days out in the woods. My little sister and I would always wait in anticipation for his return, to see if he had any good news. The best part of it all was climbing up in the back of the pick-up and getting our picture taken with his bucks! I also remember climbing on the counter so I could get into the cupboards high above to “borrow” his grunt tube… What? I was practicing! I never made it out in the woods growing up until….. I met my husband Josh. When we were dating I would go up to the Pro Shop with him to watch him shoot his bow and I was never really interested. In fact, I would be quite bored sitting there while he practiced. As far as I was concerned, hunting took up too much time and he was away from home too much. During the season when he was home, all he wanted to do was sleep. In March of 2009, I was persuaded to “just try it.” I picked up my first bow and shot my first arrow and since then I haven’t set my bow down. My first hunting experience was in the turkey woods that spring. If a turkey gobbling 50 yards away from you doesn’t get your heart going I don’t know what would! That fall I headed out to the tree stand all camo’d up for deer season. I didn’t see all too many deer that year, and none that I could shoot at least. It was a little discouraging being my first year hunting but I already knew next year I’d be back up in the tree. 2010 spring turkey season came and went (no luck with a harvest) and that summer I practiced shooting my bow at least once a week. That fall, we hunted a solid 3-4 weeks and I was getting a little frustrated with the fact that yet again, I wasn’t seeing many deer. Josh would come back to camp and say he saw 10, 11, 12, 13 deer. WHAT? What am I doing wrong?! I would have seen none or one. Grrrr. Out I went on the 1st Thursday of November… the evening hunt (remember that date). The Poplar Stand. I had just gotten done snacking on an oatmeal cream pie, and at 4:30 here comes this buck…. cruising. Big orange body, bright white rack, at least a 9 pointer. I could make out 5 points the side facing me. Wow he was wide! (His rack that is) Luckily it all happened so fast I wasn’t able to get nervous. He was so intent on getting where he was going, I drew back my bow; he had no idea I was there. 31 yards away he got stuck with a pink arrow. A decent shot, maybe 3-4 inches too high but right behind the shoulder. This is when the knee-knocking and hand shaking began. I couldn’t even get the radio out of my pocket I was shaking so badly. Ha! I head back to camp and I won’t drag out the ending of this story because it’s depressing… Long ending short, we searched the hillside for this brute for 3 days and never found him. Blood everywherebut no buck. We got blood all the way over to a neighboring property and attempted to get permission to track on the land but couldn’t contact the guy and he wouldn’t answer his door. That season ended on a depressing note for me. 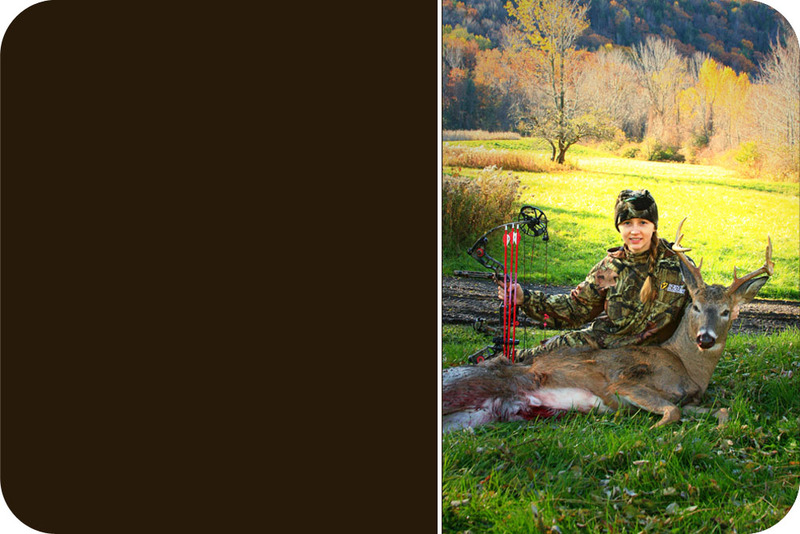 Josh was able to harvest his usual does and he shot a buck too. Admittedly that didn’t make it easier for me. Fast forward to late summer 2011. I have a new bow that I’ve been fine-tuning all spring and summer. It’s the new Matthews Passion, their first bow exclusively for women. I am ready and I’m out for blood. We were worried because this summer, wind turbines went up everywhere in Howard, NY. We have 3 alone on our hillside. We thought with all the construction and huge windmills would deter the deer. I was wrong. This year I saw more deer that my first two seasons put together. Does, skips, and 1 spike horn. 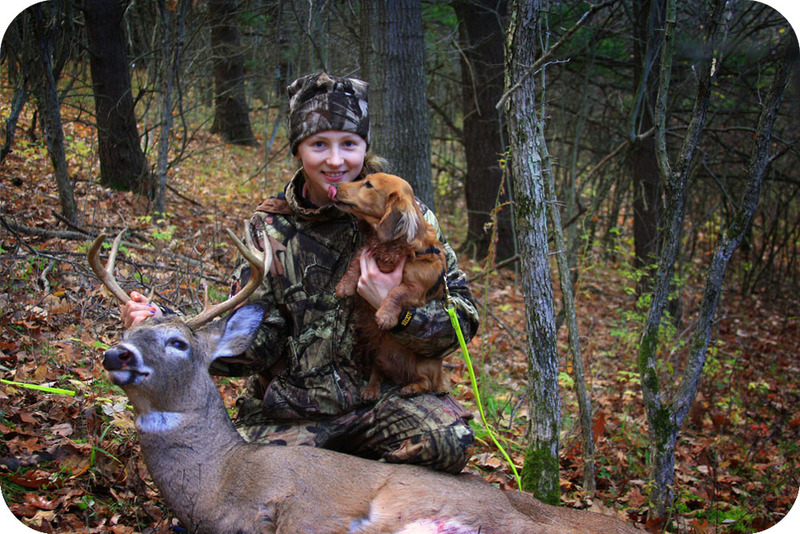 I did shoot a doe opening day but let’s not talk about that. Another depressing ending. 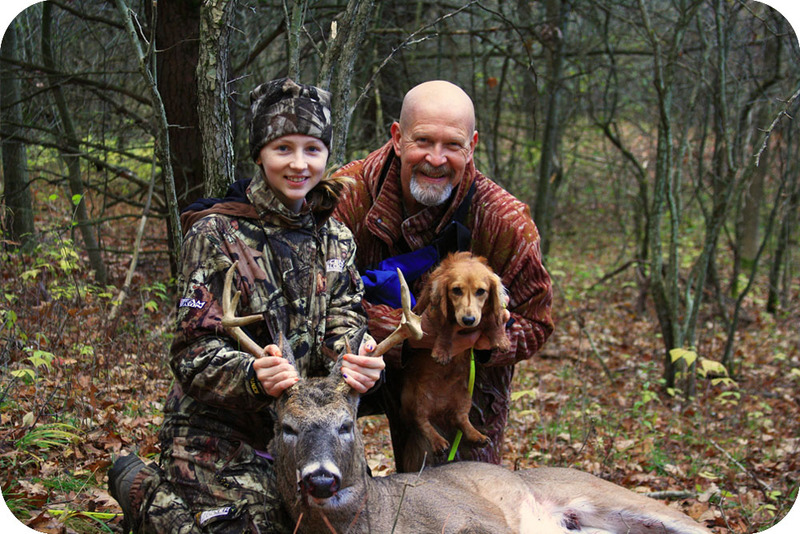 I HATE wounding deer… I strive to be an ethical hunter and I just do not like loosing animals I shoot… Josh already has 1 doe under his belt when the 1st Thursday of November rolls around. Patiently I wait in my tree stand, I again just had snacked, this time a chocolate mini-donut. Oh I should probably stand up. Okay… I hear something running to my left. Here comes this doe bounding through the woods 10 yards right behind me and out into a goldenrod field. Oh shoot, Josh is trying to call on the radio. I reached up and turned it off. She was small but I wouldn’t have been able to stop her anyways. Oh well, something must have spooked her or pushed her from a bed. Ummm nope. What’s that I hear? Grunting? Yes, that is a buck grunting. Oh. My. Gosh. She is getting chased by a buck. Oh. My. Gosh. If he takes the same path as her I am going to get a clear broadside shot of Mr. Testosterone literally 10 yards behind me. OH. MY. GOSH! *Mind you, this all is going through my head in about 0.2 seconds* More thoughts: I can’t see him. He’s stopped. Oh wait, there he is, behind that tree! Oh he is a nice buck- a shooter! I draw my Pink’d- out bow back. He’s just standing there smelling the air. Oh no… he’s going to wind me. NEVERMIND Oh here he comes! He starts to trot and he’s headed right where she went. Just a little further, few more feet… “Meh.” “MEH!” He wouldn’t stop, I had to made 2 noises to get him to stop. Does he look up at me? No. He looks for her- the doe he’s hot on. Oh this is my chance! More thoughts: Don’t screw this shot up. 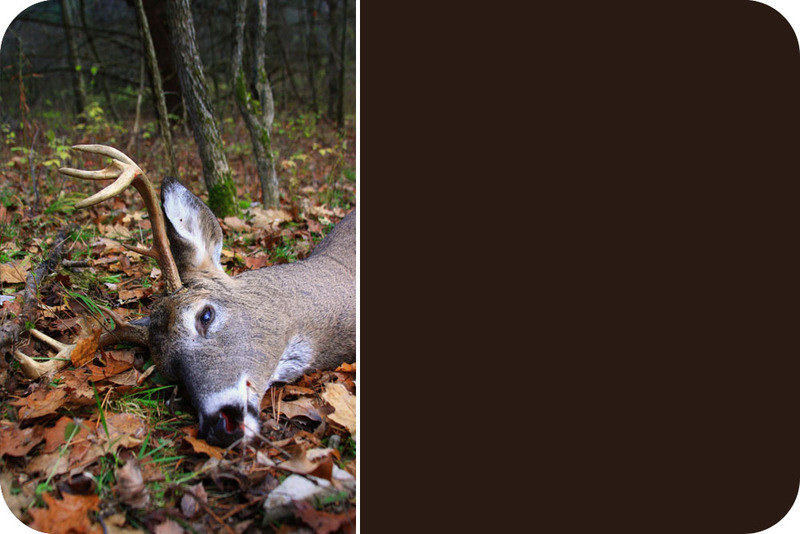 You’ve already lost a buck once (and a doe). He is 12-13 yards away! Oh boy. What pin? he’s not 10 yards, he’s not 20 yards. Oh just aim for in-between your pins. Don’t move, don’t move, don’t move… I was willing him not to move. I knew he wanted to get back to that doe and I was so worried he was going to move. A couple seconds had passed and a million thoughts are still going through my mind. HERE GOES! Swack, thud. YES! Damn, the arrow is still sticking out of him… a little too far back but angle looks good… did I get enough penetration for an exit wound? My mind is reeling. I don’t know what to think. I knew he had some mass because it looked like a point had started to kick off of his G2 but never really formed. I though maybe a basket-rack 8-pointer. I could live with that. He doesn’t compare to last year’s buck but for a first deer (if we find him) he will be perfect! I would have been happy with a doe. I watched him bee-line it across the the goldenrod field and hit the wood line on the other side- about 60 yards from my stand. I watched him stumble as he got inside the woods then lost sight of him. I radioed Josh immediately and he came on and said he just shot a doe too. A DOUBLE! Woohoo. So from here, it’s not so action-packed. I got down, headed in the opposite direction of where the deer ran which happened to be Josh’s stand. I met up with him and we went back to camp. After telling my story to the guys at camp over and over (I was excited) we hung out, had some grub, and about 3 1/2 – 4 hours later Josh, Marc (a guy at the camp) and I head up to see if we can find blood or my arrow. We did find blood and tracked him into the woods opposite the goldenrod field, and continued to track him for a little while. We really had only gone 150 yards from the stand and I decided it would be better to pull back and head back to camp. There wasn’t a lot of blood and I worried if the shot was back a little too far PLUS the deer was quartering to me, I know I didn’t get heart, maybe only 1 lung and probably liver and stomach. He was probably still alive at that point, and no exit wound (as I feared) and too hard to find blood in pitch black. Back to camp we went to let him sit overnight. Now, let me introduce you to a retiree named Chester, and his beloved dog “Moby.” Why? Because they play a HUGE part in the end of this story. This is Moby! 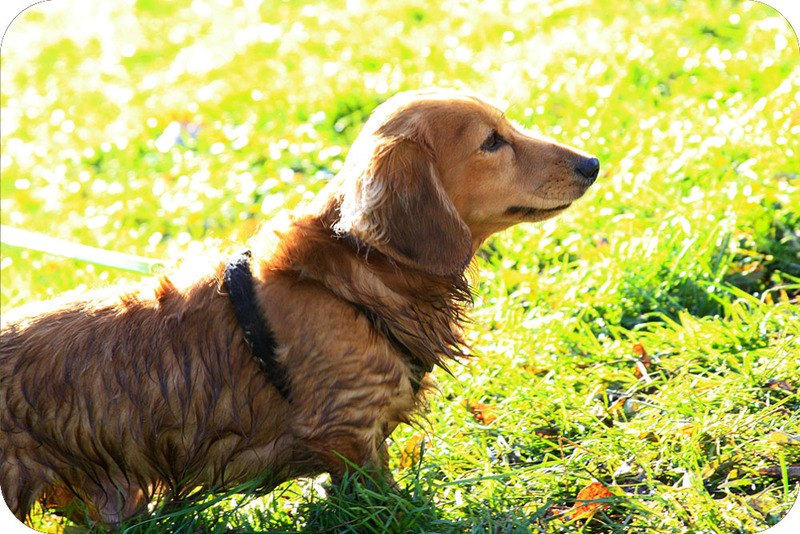 A 3 year old male, long- hair miniature dachshund. Cutie! That night, Josh puts a call into an organization in our area called Deer Search. You leave a message and their members -who are all volunteers- screen the calls, and if they decide to take your case one of them will call you back. 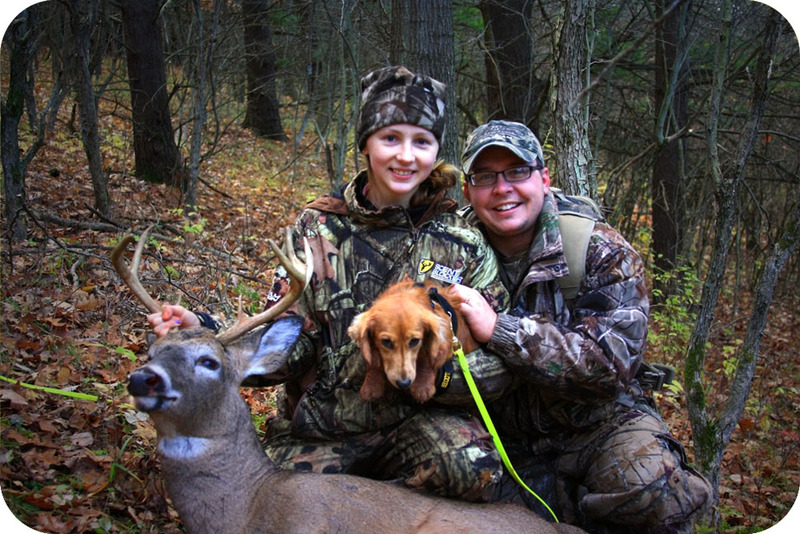 Each member owns a dog (or two) who are trained to track deer. They track on scent so a small blood trail is okay. So, a man named Chester gave josh a call back 9:30 that night, took some details and said he would meet us at 7:30 the next morning. He is from Corning, NY (about 45 minutes away from the camp) and said he usually doesn’t take cases this far from home, but he really likes to help out first-time hunters find their deer. How lucky for me. 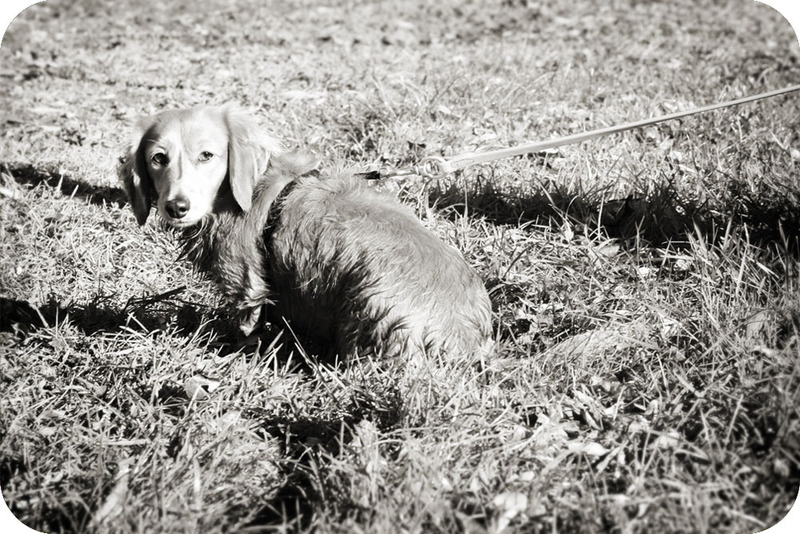 The next morning, Chester and his mini dachshund Moby met us at the camp, filled out some paperwork and away we went. He had to call the sheriff who let’s the local DEC officers know we will be tracking with a dog. Otherwise if someone gets caught in the woods with a dog, it’s illegal. So back to Moby- what a ball! We went back to my treestand, and got to watch Moby work. I had my doubts being honest. 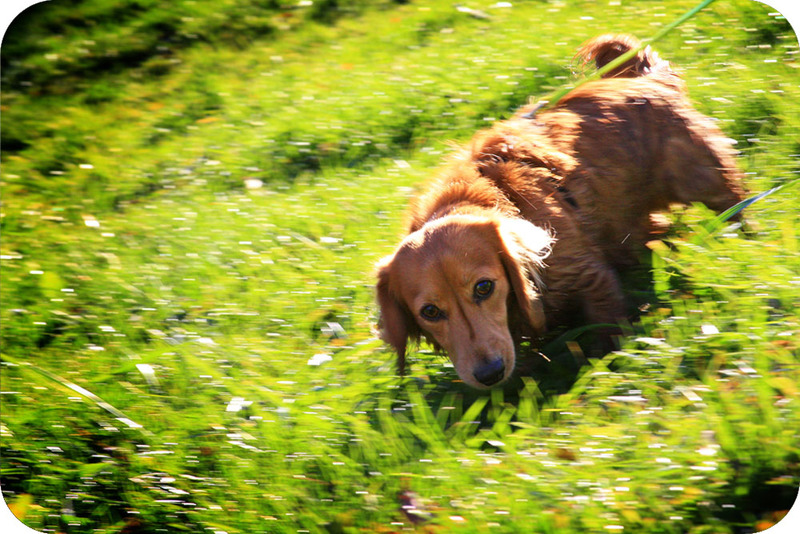 I just didn’t understand how a dog could smell a day-old deer trail. The night before we had marked the blood trail with red tape, and I started to laugh as I watched that little guy follow those red markers exactly. Wow, I was surprised. I knew then that I wouldn’t be leaving the woods without my deer. It only took Moby 45 minutes to sniff out my deer (his fastest find this year) and I hear Chester yell “Hey, you want your deer?” I ran and as I laid eyes on my buck I started to choke and my eyes welled up. Tough girls don’t cry Caryn, get it together! I asked if I could pet Moby and he said “Yes of course. Give him praise!” So I did. Moby got a LOT of kisses from me, and I got some back. 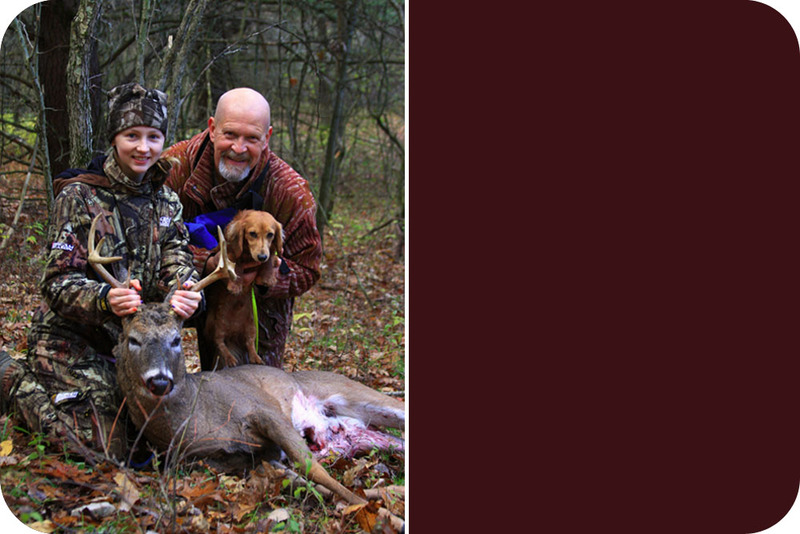 He grabbed the deer, pulled on his legs, roughed him up a bit, and pulled some hair out with his teeth. He was so happy to find the deer and I was happy to watch him be happy. After giving Moby his deserved attention, I reverted it back to my deer. My first thought? Wow, he is bigger than I thought. Oh. My. Gosh is he ever- he looked much smaller from the treestand! I was in disbelief. I could NOT believe my first deer was on the ground. Big bodied! After three long seasons of frozen fingers and toes, after losing 2 deer before him, the third time’s the charm all the way around. And I have Chester and Moby to thank! This is a picture with Chester, his awesome dog “Moby,” my buck and I. Chester estimated him to be a 3 1/2 year old deer, a 9 pointer at one time but you can see where a tine got broke off. After field-dressed, he weighed about 160 pounds. I don’t think I was the only one excited this day. Remember how I said this was a volunteer organization? 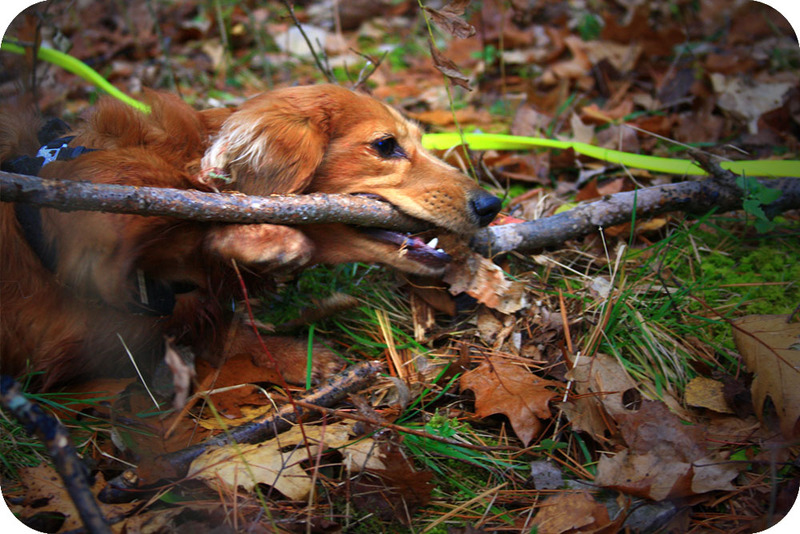 Chester and other members like him sacrifice their time away from home and their families to come help people find their deer. I would imagine they have a deep and sincere love of the sport in order to do this. I can not put into words how thankful I am to Chester for taking the time to come with his dog and I feel as I am forever in debt to them. After all this is no ordinary deer. My first deer ever, and it be a nice Western NY whitetail buck! So I offer you, Chester, and your fantastic dog Moby my deepest thanks and appreciation for what you did for us this season! Great sniffin’ work Moby! Once gutted and back at the camp, we waited for the other 2 guys hunting to get back and once they drove up the drive and got a look at my deer, I was greeted with big smiles and high-fives. It felt great to have friends be excited for me. They thought I was nuts calling this guy a “basket-rack” and Marc nicknamed me “Lady Ice” because I have ice water running through my veins. LOL! I love it. It’s sort of true, I don’t get nervous shooting the big bucks (until afterwards of course when I’m shaking like a leaf). We got some more pictures and you know me, I love pictures so we took a lot to document this day I will never forget! There is one more person I can not forget to thank and that’s Josh. He is the one who got me into the tree stand, he is the one who pays for all the gear, licenses, and everything else. Thank you so much Josh for everything you do to get me out there and I love being able to share this with you! Love ya Babe! And of course, I can not go without thanking God for providing me with the opportunity to harvest and use the animals he put on earth! On the last note, I would like everyone to meet “Remington” who is the new camp kitty. If you feed them once, they’ll always come back around. Unsure where he came from, just wandered around a few days back. A very friendly boy who won’t leave my side now. His side of the bargain is to kill all the mice around camp (which there are a lot)! Here’s to happy hunting. 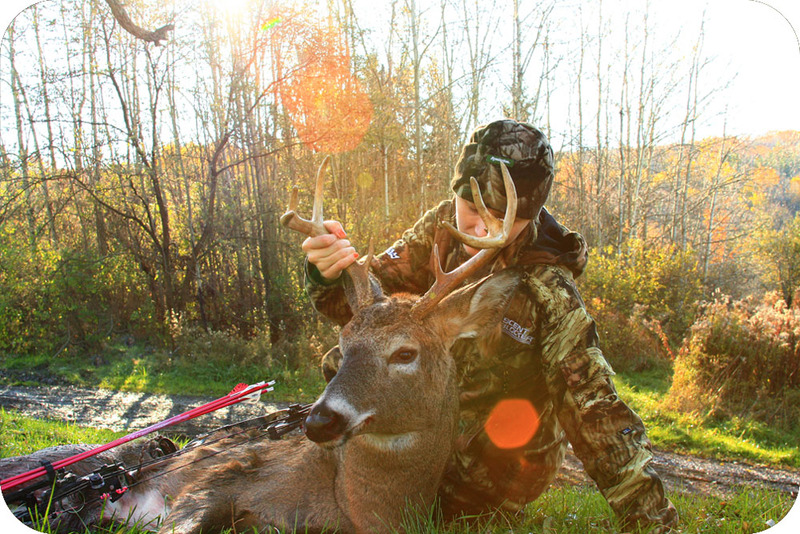 Good luck to all those out there still waiting for their moment in the woods. It’s about patience, 1% skill and 99% luck! Thanks to all for looking!